...But that's never stopped me before! Anyway. I've never seriously made resolutions before. Last year I had the Apostrophe Rules, but two days after making them I got rid of them because they were too... well, ruley. Year before that I had that dreamboard that was just an excuse for some cutting and pasting fun. But this year is going to be different! Get a bank account. But this is so grown-up! And yet, I really should do this. Read one book every month. Yes, I know twelve books in one year is extremely pathetic, but I've just joined a book club, so I have to read a book every month anyway. And that isn't the max. Write a letter/email to someone I admire every month. I'm terrified of this one. But I'm going to do it anyway. You never know, I might get a reply. Now, for some internet stalking. Go to the cinema any time I want. Yes, I know this is pathetic. But it is something I genuinely find quite hard to do. But not anymore! Finish my super-secret play. You know you have to stick something out when you've bought it a necklace that you happened to spot in Claire's one day and is somehow related to a play you're writing. Start researching the Art Movements of the 19th and 20th Century that are on the poster I have in my room. Because I really want to know what Bauhaus is. It's so fun to say. Write at least one blog post a week. Look! I'm doing it! This is my second of the week! Read more plays. Because, as great as books are, plays are just that easier to get into. Somehow, you can imagine things better. Or maybe this is just me. Also, I like plays. Go swimming. This is one of my mother's resolutions, and I thought I might join her in completing it. No harm sure. 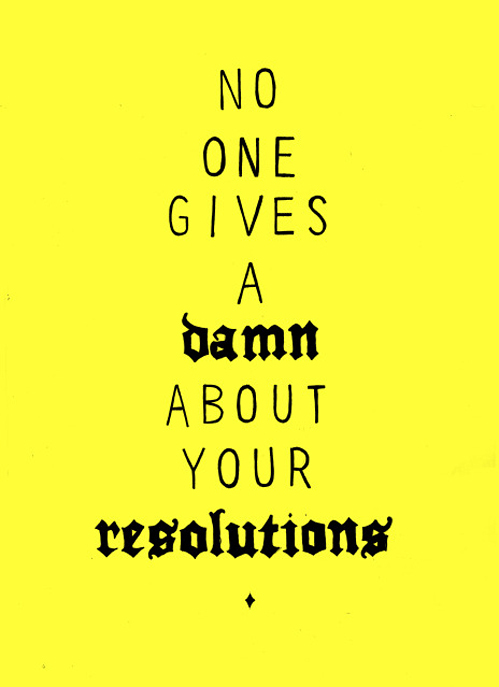 Have you made resolutions this year, or are you into that sort of thing? All of your resolutions are great-- I particularly like the one about writing a letter/email to someone you admire. Good luck completing your resolutions this year! I like your list, especially the fourth bullet point. Going to see movies whenever you feel like it sounds like heaven. =) This New Year, I looked at the resolutions my mom made me write down for 2011, and I was amazed how far I'd come. I'd both (a) gotten into college and (b) figured out my plan for the next few years, which I hadn't really expected to do. So this year, I really felt inspired to write down a few resolutions, if only to be able to look back, at the end of the year, on my perspective at the start of the year. This was first year in my life I really felt like making resolutions and I couldn't think of a darn thing. Mm. Maybe there's still time, but I'm going back to school tomorrow. We'll see.